Download "Intunex Oy Skillhive Service Description 1 / 6"
1 Intunex Oy Skillhive Service Description 1 / 6 About Skillhive Skillhive is a social business application designed for connecting and sharing expertise within organizations. Skillhive enables employees within an organization to connect with the right people who are experts in a specific topic or field of work and ask for their assistance. Communication and assistance takes place within swarms of experts which are organized around shared objects: ideas, problems or projects. With Skillhive the right expertise can be gathered effectively from across the organization for projects or other resourcing needs. Problem solving becomes faster and experts are able to make better decisions together. At the same time the management gets a new and up to date view on personnel skills and interests within the organization Skillhive s customers use the software for various purposes: Competence management: Locating, bringing forward and accessing hidden expertise. Resourcing expertise to support projects, sales and product development. Developing an open organizational culture that supports collaboration and learning. General (Technology) Skillhive is mainly provided as a SaaS solution, which means that the software and associated data are centrally hosted by Intunex Oy. It is also possible to install Skillhive on Client's own servers. Client is responsible for the server environment, server security, data security procedures including firewalls, encrypted network connections, monitoring, log files and other relevant issues. Technical framework: Skillhive is a business application and it uses the latest technologies such as HTML5, Apache, MySQL and PHP. Skillhive utilizes common secure and user friendly frameworks like Elgg, Symfony2 and Bootstrap. Mobile use: Skillhive works on all modern web browsers and mobile devices like tablets and smartphones. 2 Intunex Oy Skillhive Service Description 2 / 6 Security Physical security: Skillhive s servers are maintained on officially certified secure location in Finland. The servers are hosted in secure facilities with restricted access and 24/7 monitoring. We also offer Skillhive as an on premise solution for customers who prefer to use their own data centers. Network security: Servers are hosted behind sophisticated firewalls, with a protected perimeter. Encryptions: All transmissions to and from Skillhive including sign on are encrypted at 256 bit through SSL via HTTPS. Application security: Skillhive is built on Elgg platform which is known to be very secure. There are many different security measurements built in Skillhive which take care of all the typical web application vulnerabilities such as SQL injection, Cross Site Scripting, Cross Site Request Forgery, format string vulnerabilities, buffer overflows and so on. Authentication and authorization: User authentication or authorization can either be based on Skillhive s secure user management system, which uses the best practices of modern user management. 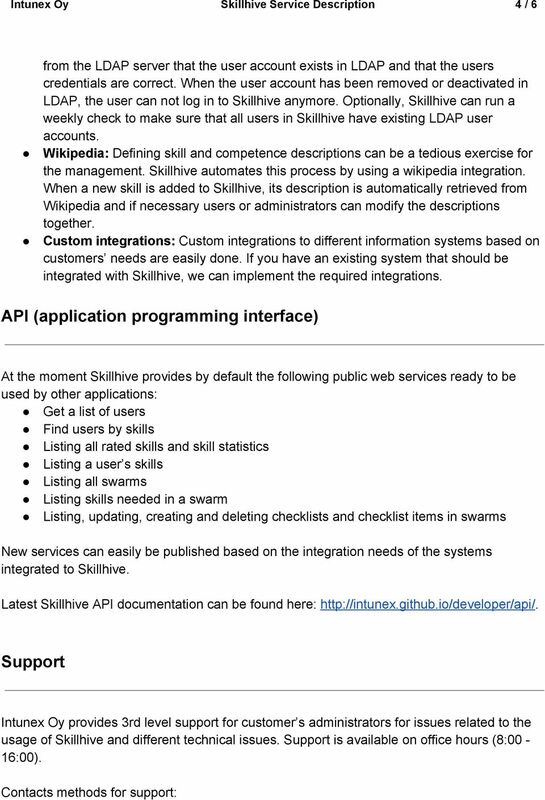 It is also possible to integrate Skillhive to any other user management system (for example AD) which provides LDAP interface. Permissions: Access to workspaces and files is restricted, with full administrative control. Company specific information can be viewed by all of the employees. Personnel belonging to the same organization are recognized based on their domain. For example, profile registered for the same domain can be viewed by those who have the same domain. Information security: Personal information is held according to the Finnish Personal Data Protection Act which is in accordance with the EU legislation and is not given to any third parties. The priority is to guarantee the continuous usage of the service, to prevent any unauthorized access to information or systems and to prevent deliberate or accidental corruption of information. Privacy protection report which is in accordance with the Finnish Data Protection Act (523/1999) can be found here: Database backups: Full database backups are taken daily and are kept for at least 14 days. File backups: Full backups of uploaded user files, such as user icons and uploaded CV s, are taken weekly. Incremental backups are taken daily. On premise security: If Skillhive is installed into the Client's own servers, the responsibility for data security is divided between the Client and Intunex. Intunex is held liable for the data security of Skillhive software. The Client is responsible for server security, data security procedures including firewalls, encrypted network connections, monitoring, log files and other relevant issues. 6 Intunex Oy Skillhive Service Description 6 / 6 application. The Customer is responsible for servers, network connections, server security, data security procedures including firewalls, encrypted network connections, monitoring, log files, backups and other relevant issues. How to buy Contact sales: Contact us and we will arrange a meeting where we can discuss your needs and agree on what is the best deployment solution for your organization. At the same time we can evaluate possible integration procedures to existing processes and systems. Contact information: or directly Contact partner: If you are interested in other HR services and software in addition to Skillhive, you can contact our partner HR4: (Finland) Self service: Registering to the service on your own is also fast and easy: You need a company to register at skillhive.com. Registration will only take a moment and you will only have to input your and password. After registration, the user must pay the first monthly fee. Payment can be done with most credit cards. After this the service is ready to be used and the first user will become organization's internal Skillhive hub s administrator (main user). Rest of the personnel can register to the service simply using their company s.
1. Please login to the Own Web Now Support Portal (https://support.ownwebnow.com) with your email address and a password.